The "Pentium-in-the-corner" . It's a 2.66 hz with 512 meg ram. CD-RW, & DVD Player plus color HP printer complete the package. We're running XP with Office 2003 so you're set up to surf, write the Great American, crunch, or research to your hearts desire. For the newbie, we're here to help when necessary. Sherman's ICE CREAM of South Haven, Michigan provides us with what we believe is the best ice cream in the area. Moose Tracks, Blue Moon, Grasshopper...whatever your pleasure, Sherman's is the best. Sit at the old fashioned soda fountain and watch us make you a real ice cream soda or shake or green river float or black cow. More importantly, bring your kids and let them watch. Show them that ice cream is more than waiting in a long line at the drive through window! Superior COFFEE is our coffee of choice. Flavored or our special house blend. Said by many to be the best coffee in town. Or try our selected flavors from the Chicago Coffee Roastery including the ever-popular Jamaican-Me-Crazy. Our gourmet CHOCOLATES come from the South Bend Chocolate Company. 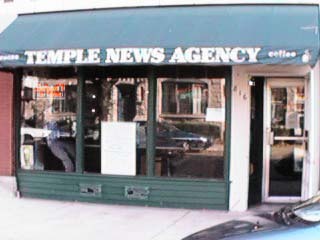 Again and again, Temple carries the best! Hey, COFFEE LOVERS! Time to try your favorite in a whole new way. We serve iced coffee, cappuccino, lattes, and mochas. But, for something you can't get anywhere else, order a TEMPLE BRAVO...The American milkshake goes Italian! Doubleshot of espresso...coffee syrup...and Sherman's Finest Cappuccino ice cream...whipped cream and cinnamon. No naps allowed! For you FAT CONSCIOUS types, we offer the SKINNY BRAVO, made with LOW-FAT vanilla yogurt for the taste without the fat. The Bravo and Skinny Bravo...Milkshakes with an attitude...only at Temple News. And... The Temple SAMOAN SMOOTHIE...cool, ultra-low-fat and delicious. Strawberries, banana, Snapple and Sherman's low-fat vanilla yogurt. Blended into a unique taste...lighter than our shakes but full of flavor and ready to refresh. The Samoan Smoothie...only at Temple News. The frosty mug of rootbeer, the cherry (or vanilla, chocolate or strawberry) Pepsi, the ol' green river or black cow, the Italian soda...cool off at Temple, whatever the weather. FRENCH PRESS COFFEE by the cup. We suggest French Roast, although the choice of coffees is yours, ground fresh and brewed as you wait. Hot, strong, and full of flavor. A cup from the French Press...new at Temple. ANY TIME - ANY SEASON...you can get want you want at Temple.